For uses of "Estremadura", see Estremadura (disambiguation). Extremadura (English /ˌɛkstrᵻməˈdjʊərə/; Spanish: [e(ɣ)stɾemaˈðuɾa]; Extremaduran: Estremaúra [eʰtːɾemaˈuɾa]; Portuguese: Estremadura [(ɨ)ʃtɾɨmɐˈðuɾɐ]) is an autonomous community of western Spain whose capital city is Mérida. Its component provinces are Cáceres and Badajoz. It is bordered by Portugal to the west. To the north it borders Castile and León (provinces of Salamanca and Ávila); to the south, it borders Andalusia (provinces of Huelva, Seville, and Córdoba); and to the east, it borders Castile–La Mancha (provinces of Toledo and Ciudad Real). Its official language is Spanish. It is an important area for wildlife, particularly with the major reserve at Monfragüe, which was designated a National Park in 2007, and the International Tagus River Natural Park (Parque Natural Tajo Internacional). 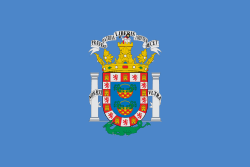 The government of Extremadura is called Gobierno de Extremadura. Extremadura is contained within 37° 57' N, 40° 85' N latitude and 4° 39' W, 7° 33' W longitude. The area of Extremadura is 41,633 km², making it the 5th largest of the Spanish autonomous communities. It is located in the Southern Plateau (a subdivision of the Central Plateau). In the north is the Sistema Central with the highest point in Extremadura, 2,401 m high Calvitero. The main subranges of the Sistema Central in Extremadura are the Sierra de Gata and Sierra de Béjar. In the centre is the Sierra de las Villuercas which reaches an altitude of 1603 m on the Pico de las Villuercas. Other notable ranges are Sierra de Montánchez and the Sierra de San Pedro, which form part of the greater Montes de Toledo system. To the south rises the Sierra Morena which separates Extremadura from Andalusia with Sierra de Tentudía where the highest altitude of these mountains in Extremadura is Pico Tentudía with 1104 m.
The basin of the Tagus, with two principal tributaries: to the right: the Tiétar and the Alagón and to the left: the Almonte, Ibor, Salor and the Sever. The tributaries on the right edge carry a large quantity of water, which feed the gorges of the Sistema Central where the rainfall is abundant and the winter brings a great quantity of snow. The basin of the Guadiana, which has principal tributaries: to the right: Guadarranque and Ruecas to the left: Zújar River which is its plentiful tributary and the Matachel. The basin of the Guadalquivir with only 1411 km² in Extremadura (2.45% of total). The basin of the Duero with only 35 km² in Extremadura (0.04% of the basin). The climate of Extremadura is Mediterranean, except to the north, where it is continental, and to the west, where the influence of the Atlantic makes the climate milder. In general, it is characterized by its very hot and dry summers, with great droughts, and its long and mild winters due to the oceanic influence because of its proximity to the Atlantic coast of Portugal. The yearly temperature fluctuates between an average minimum of 4 °C and an average maximum of 33 °C. In the north of Extremadura, the average temperatures are lower than those in the south, with temperatures gradually rising south towards the Sierra Morena, where they drop because of the altitude. During the summer, the average temperature in July is greater than 26 °C, at times reaching 40 °C. The winters are mild with the lowest temperatures being registered in the mountainous regions, with an average temperature of 7.5 °C. The average snowfall is 40 cm mainly occurring in January and February. 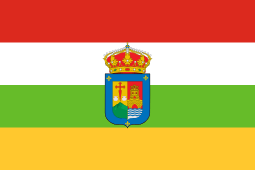 As of January 1, 2012, the population of Extremadura is 1,109,367 inhabitants, representing 2.36% of the Spanish population (46,745,807). 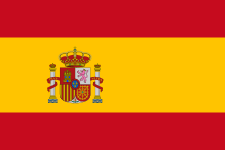 The population density is very low (25 people/km²) compared to Spain as a whole. The most populous province is that of Badajoz, with a population of 691,715 and a population density of 31.78 people/km². With an area of 21,766 km², it is the largest province in Spain. 413,766 people live in the province of Cáceres at a density of 20.83 people/km², having an area of 19,868 km², making it the largest province in Spain after Badajoz. 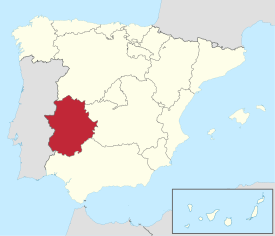 Within the region of Extremadura, there live 29,068 foreign citizens, according to the INE census of January 1, 2007, of which 16,647 reside in the province of Badajoz and 12,421 in the province of Cáceres. The largest immigrant community is Moroccan with 9,218 people, followed by Romanians with 4,324. There are 98 Icelanders and 6 Liechtensteiners. Brazilians account for 1,676 and Colombians make up 1,409. Of immigrants from Sub-Saharan Africa, the largest community is Senegalese with 88 people. Of those from Asia, the Chinese make up the largest group with 631 people. There are also 3,492 Portuguese neighbours living within the region. The Extremaduran population, according to the 1591 census of the provinces of the Kingdom of Castile, was around 540,000 people, making up 8% of the total population of Spain. No other census was performed until 1717, when 326,358 people were counted as living in Extremadura. From this period, the population grew steadily until the 1960s (1,379,072 people in 1960). After 1960, emigration to more prosperous regions of Spain and Europe drained the population. Extremadura is divided into 383 municipalities, 164 are part of the Province of Badajoz and the other 219 are part of the Province of Cáceres. There are also traditional comarcas in Extremadura, like Las Villuercas and Las Hurdes, but these don't have much official recognition. 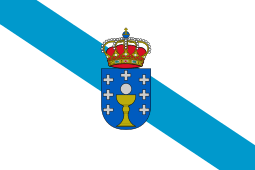 A Fala, a Galician-Portuguese language, is a specially protected language and is spoken in the valley of Jálama. The Extremaduran language. It is related to Leonese and is severely endangered. It is taught neither publicly nor privately. The Portuguese language in Cedillo and Herrera de Alcántara, and also spoken by some people (mainly those born before the 40's ) in Olivenza. 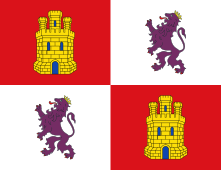 Lusitania, an ancient Roman province approximately including current day Portugal (except for the northern area today known as Norte Region) and a central western portion of the current day Spain, covered in those times today's Autonomous Community of Extremadura. Mérida (now capital of Extremadura) became the capital of the Roman province of Lusitania, and one of the most important cities in the Roman Empire. 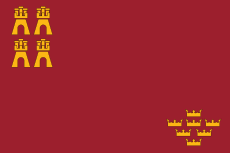 During the Andalusian period as of 711, present-day Extremadura was on the north-western marches—extremadura is from Latin words meaning literally "outermost hard", the outermost secure border (the march) of an occupied territory—with Mérida being its head city. It was part of the Umayyad Caliphate of Córdoba, but after its definite collapse in 1031 the Caliphate fragmented into small regional kingdoms, and the lands of Extremadura were included in the Taifa of Badajoz on two taifa periods. The kingdom in turn broke up twice under Almoravid and Almohad push (1094 and 1151). After the Almohad disaster in Navas de Tolosa (1212), Extremadura fell to the troops led by Alfonso IX of León in approx. 1230. Extremadura, which was an impoverished region of Spain whose difficult conditions pushed many of its ambitious young men to seek their fortunes overseas, was the source of many of the initial Spanish conquerors (conquistadores) and settlers in America. Hernán Cortés, Francisco Pizarro, Gonzalo Pizarro, Juan Pizarro, Hernando Pizarro, Hernando de Soto, Andres Tapia, Pedro de Alvarado, Pedro de Valdivia, Inés Suárez, Alonso de Sotomayor, Francisco de Orellana, Pedro Gómez Duran y Chaves, and Vasco Núñez de Balboa and many towns and cities in North and South America carry names from their homeland. Examples include Mérida is the name of the administrative capital of Extremadura, and also of important cities in Mexico and Venezuela; Medellín is now a little town in Extremadura, but also the name of the second largest city in Colombia; Albuquerque is the largest city in New Mexico and its name is due to a transcription mistake of Alburquerque, another town in Extremadura. The two (to date) Spanish astronauts, Miguel López-Alegría and Pedro Duque, also have family connections in Extremadura. 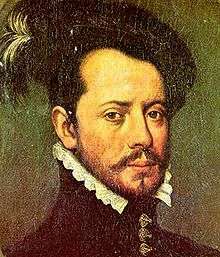 King Ferdinand II of Aragon died in the village of Madrigalejo, Cáceres, in 1516. 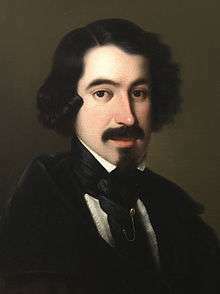 Pedro de Valdivia founded numerous cities in Chile with names from small villages in Extremadura, such as Valdivia and La Serena. The capital Santiago de Chile was founded as "Santiago de Nueva Extremadura" (Santiago of New Extremadura). Wild Black Iberian pigs roam in the area and consume acorns from oak groves. These pigs are caught and used for the cured ham dish jamón ibérico. The higher the percentage of acorns eaten by the pigs, the more valuable the ham. For example, Iberian Ham from pigs whose diet consisted of 90%+ acorns can be sold for more than twice as much as ham whose pigs ate on average less than 70% of acorns. In the US, Iberian Ham directly from Extremadura, bone-in, was illegal until around 2005. At that time, enough U.S. restaurants were in demand for the delicacy that Spain decided to ship it bone-out, which the U.S.D.A. 's health codes would (and continue to) approve. 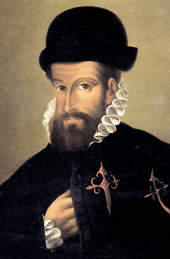 Many legendary Spanish conquistadors hailed from Extremadura, including Vasco Núñez de Balboa the first European to lead an expedition to reach the Pacific from the New World, Hernando de Soto the first European to lead an expedition to the territory of the modern-day United States, Hernán Cortés and Francisco Pizarro, who conquered the Aztec and Inca empires respectively, Francisco de Orellana, who explored the length of the Amazon river, Pedro de Valdivia, the first governor of Chile, Sebastián Vizcaíno who was a Spanish soldier, entrepreneur in the Philippines, explorer of the Californias, and diplomat in Japan. José Calderón, a National Basketball Association player. Fernando Morientes, a former football player. Adelardo, a former football player. Rafael Gordillo, a former football player. Ernesto Valverde, a former football player and now coach. César Sánchez, a former goalkeeper. Manolo, a former football player and now coach. Paco Herrera, retired footballer and a current manager. Óliver Torres, football player at Atletico De Madrid. Extremadura has produced many musicians, including: Soraya Arnelas (singer), Luis Pastor (singer), Roberto Iniesta (singer of rock band Extremoduro), Pablo Guerrero, Bebe (singer), Alberto Porro Carmona a.k.a. Al Carmona (music conductor), Esteban Sánchez (pianist), Gecko Turner (singer). TV personalities include: Isabel Gemio, Maruchi Leon, Agustín Bravo, and Berta Collado. ↑ INE. Censo 1960. Tomo III. Volúmenes provinciales. ↑ Maria da Conceição Vilhena. 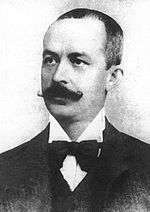 Hablas de Herrera y Cedillo. Wikimedia Commons has media related to Extremadura.